The Janma Rashi which is your moon sign is ruled by a planet, it is known as Rashi lord. If there is friendship between the lords of the Janma Rasi of the Girl horoscope and the Boys horoscope, then harmony in the relationship is said to prevail. If there is no friendship then there will be strong ego clashes, arguments, strong differences of opinion and frequent conflicts. Graha Maitri koot matching is a very important part of Guna Milan or Kundali Milan. It is the 4th most important Koot in ashtkoot guna Milan as it has 5 score, just below Gana Koot, Bhakoot Koot and Nadi Koot. Graha Maitri Dosha is formed when the Graha maitri score is zero in Guna Milan. You need to note that Graha Maitri is a good indicator to match the mental compatibility of the couple. As we are referring to the moon, which is the significator of mind, here we are talking about mental compatibility of the partners in the relationship. A dosha in the Graha Maitri indicates no compatibility on the mental level. Many times many young couple who visit me say that they feel a very strong compatibility. I need to remind them that there are two types of compatibility, one is the physical compatibility and the other is the mental compatibility. If there is only a physical compatibility then surely it will fail if it is not backed and supported with mental compatibility. You also need to remember that If there are other doshas in horoscope matching like Gana Dosha and Bhakoot dosha then marriage should not be considered unless there is strong Grah Milan and strong 7th house of the natives. 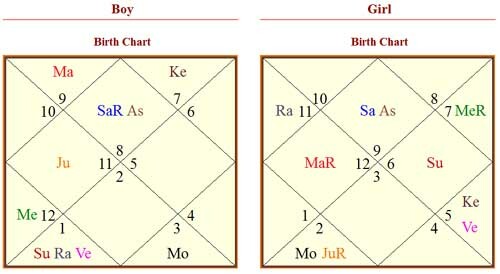 In the example given below we see that the rashi of the boy is Gemini and the girl rashi is Taurus. Mercury which is the lord of Gemini and Venus which is the lord of Taurus are friends we see that there is full Graha Maitri Score. In this case the Horoscope matching will get 5 score out of maximum 5 in Graha maitri in Guna Milan. The Score of Graha Maitri is based as below. If there is Graha Maitri Dosha in the horoscope Matching, then you should get a detailed Guna and Graha milan done to be sure that there is happiness and bliss in your marital life. There is no point in marriage if there will be problems and no harmony in the relationship. To get a detailed Horoscope Matching – Kundli Milan, you can look at my paid services below. I am looking forward to get married and its an arrange marriage, A very good girl from good family is the proposal that me an my family are looking for My Birth details are 18th April 1986 Time : 20.30 , place : Amravati Maharashtra. where as Girls details are 5th June 1988 Time: 14.12, Place: Firozabad Uttar Pradesh. 1. Sir, in Online Kundali Milan it shows 28 Gunas are matching all Gunas are going well and appears with Graha Maitri Dosha, will it be good to go ahead, do other good milan from ashtakoot minimise this Maitri DOsha. 2. When matched from panditji he says 16 gunas are matching and not advised to proceed. Please give me your guidance. In your horoscope matching 28 Guna match. However the Graha Maitri score is very less, which is not good. As it indicates strong likes and dislikes, it also indicates ego problems between the couple. A String Guna milan is only half of the horoscope matching done. You should get a Gun and Grah milan done . Grah milan which is matching of the planets is equally important to gauge marital happiness. You can read more about Grah milan on this website. I need your favor and support regarding the problem in the Kundli i hope you don’t mind helping me. I won’t waste much time and going through details in short. Birth Place: Maliya Hatina Junagadh Dist. Our family have matched the kundlis but they said its not possible, so i want your help to find remedies or solution. If our grahamaitri score is good can we proceed?? GrahaMaitri is one of the many things that are checked in Kundali Milan. Gharamairti is also very important. It checks mental compatibility between the couple. If there is no GrahaMaitri, it means that there will be strong ego issues, likes and dislikes and difference of opinion. I can only comment on your horoscope matching after studying the birth charts of both. The Guna milan between Nidhi and Himanshu is 25 Guna matching out of 36. There is Varna, Vashya dosha in your horoscope matching. Dosha indicates relationship problems, for which remedies need to be performed for Happy marital life. Varna and Vashya in Ashtkoot Guna milan can be avoided if other factors in your kundali milan are favourable. Below is me and my partners’s kundali matching details. Our Maitri is not matching, its 0.5 out of 5. upto this point of time i’ve understood that its not the good match. Can you please help me out? is there any way to cancel out the maitri dosh? Please help me out? we want to marry each other. Read my blog navagrahastro.blogspot.in wherein there is a scientific method of checking horoscope compatibility. If you are interested come through Paid consultation. My DoB 06/08/86 time 0650 AM place Danapur Patna.
. Girl DoB 22/12/92 time 0400 AM place Tires Kannauj UP. Grahmaitry shows only 0.5 points out of 05 and Nadi dish shows 0 points. Total Gun points are 18.5 out of 46. Should we go for marriage. And how to eleminate Maitry and Nadi dosh. Read my blog navagrahastro.blogspot.in wherein there is a scientific method of checking horoscope. If you are interested come through Paid consultation.